Indiana Pacers point guard C.J. 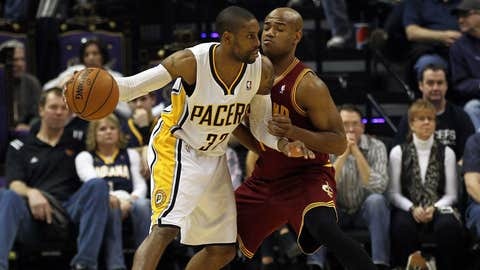 Watson (32) dribbles the ball while being guarded by Cleveland Cavaliers point guard Jarrett Jack (1) during the second quarter at Bankers Life Fieldhouse. CLEVELAND — Every chair in the cramped visiting dressing room faced the same direction. The players were seated by side-by-side, their backs to their lockers, each looking straight ahead. It’s as if the school bell rang and the Indiana Pacers were quieting down for class. Only this was after the Pacers had just scrapped to an 82-78 win over the Cleveland Cavaliers. Class was dismissed, and the Pacers had aced it yet again. Usually, win or lose, most guys immediately head for the showers. Some stop long enough to grab a plate of food off the buffets positioned in the middle of every dressing room. Others put on head phones, get dressed and ignore the outside world. Not the Pacers. Not on this night, anyway. Everybody sat still. Everybody just relaxed. Some smiled and chatted quietly with a teammate. Center Roy Hibbert stared at a printout of the final box score. Forward David West slouched with ice wrapped on his knees, eventually partaking in a casual conversation with a reporter. Big man Luis Scola removed his jersey and used it as a towel to wipe sweat from the back of his neck. Point guard George Hill sort of laughed at backcourt-mate Lance Stephenson, seated several chairs over from Hill, as Stephenson said something that traveled no further than Hill’s chair. And star swingman Paul George, positioned between Hill and Stephenson, sat up a little as the media slowly gathered around him. In the process, George’s cellphone fell from his chair and crashed to the floor, resulting in a gasp from a nearby onlooker. George, however, didn’t even acknowledge the mishap. He just talked about his team. "I know coach is going to be on us about giving up a big lead," George said. He’s right about that. The Pacers led by as many as 16 points in the fourth quarter — before holding on to win by a whisker. "No style points tonight," said Pacers coach Frank Vogel, smiling. "None. Zero." Perhaps not, if you’re talking about the manner in which the Pacers won. It was physical. It was ugly. It was the Pacers blowing what seemed like a sure thing and allowing the depleted and burdened Cavs to make it interesting. But for the 26th time in 33 games, the Pacers won. And while they didn’t win in style, they certainly displayed a refreshing dose of it afterward. They displayed class and unity, how things are done the Pacer Way. "We just want to win," West said, repeating himself for emphasis. "Bottom line is we just want to win." The Pacers weren’t built like so many experts say a contender must be built. Most of this roster was assembled by NBA legend and Pacers president Larry Bird — although he’s quick to scatter praise to the entire front office, including forever-steady owner Herb Simon. The Pacers rarely played the NBA Draft lottery. George is their best player, and he was drafted 10th overall in 2010. Hibbert was selected 17th in 2008; Stephenson in the second round (40th overall) in the same draft as George. Nor have the Pacers made huge splashes in free agency or grabbed headlines with eye-popping trades. West may be the least-appreciated member of the draft class that produced LeBron James, Carmelo Anthony and Dwyane Wade. West was selected 18th overall by New Orleans in 2003. He signed with the Pacers as a free agent in 2011 (then re-upped this past summer). Hill was drafted No. 26 overall by San Antonio in 2008. He came to the Pacers via a draft-day trade (for 15th overall pick Kawhi Leonard) in 2011. Again, these aren’t the type of maneuvers that get the masses buzzing. The Pacers aren’t following the Oklahoma City Thunder Plan — a draft-high blueprint for supposed small-market success. Instead, Bird and the Pacers merely assembled a team of scouts with an eye for who fits, who works well with others, who can be aggressive and physical under a laid-back and fun-loving coach such as Vogel. It’s an interesting dynamic for a team that has avoided the lottery and taken the logical steps each season — the first round of the playoffs three years ago, the conference semifinals two years ago, the conference finals last year. So as unique as it is, the Pacers’ display of harmony after squeaking out a tough victory isn’t necessarily a shocker. They win as a team, they chill as a team. "We’ve been in that position so many times, we know how to play in that situation," George said. "The best thing for us was to just stay together." He was talking about the game on that particular night. But for the Pacers, it’s obvious it could have been any night. 1. Maybe the New York Knicks are finally getting it together. They started the New Year with a trip to Texas, winning at San Antonio and at Dallas, and losing by just two points at Houston. "It’s a good, successful trip," said Knicks coach Mike Woodson. "… It should be a boost for our team. We got to go home and establish something." 2. Would the Knicks swap Carmelo Anthony for Los Angeles Clippers forward Blake Griffin? Recent reports suggest they’d consider it. "Silly and stupid," Anthony said of those recent reports, and he’s probably right. 3. Meanwhile, the Detroit Pistons seem to be heading in the other direction. They followed a 10-10 start by losing 10 of their next 14. "This is most definitely an emergency right now," said guard Brandon Jennings. "It is slipping away from us. You start questioning if everyone is willing to sacrifice and do the things that we need to win games." 4. Last time the Golden State Warriors won nine in a row? Try December of 1975, when Rick Barry and Phil Smith were the stars in uniform. But Stephen Curry, Klay Thompson and the rest of today’s Warriors did it again after a blowout victory at Washington on Sunday. "It puts into perspective the history of this franchise, and how far in a short period we’ve been able to turn it around," said coach Mark Jackson. 5. NBA teams can start signing players to 10-day contracts (as of Monday). Keep an eye out for D-League types such as guard Manny Harris and forward Chris Wright. Both have been playing well and catching the attention of scouts. Harris (Cavaliers) and Wright (Warriors) both have NBA experience.